In our WOTOFO Troll RDA V2 Review we outline why any serious builder NEEDS one of these set-ups in their rotation! When the first Troll RDA came out it was a hit. This one will be no different as this Troll, which is known as the Troll RDA V2 takes everything that made the original Troll RDA great, and adds in a bunch of cool updates — so, yeah, it should be better. The box has a very cool design printed on it; very eye-catching stuff. The inside of the box is where the magic happens, though, and inside the beautiful Troll RDA V2 awaits, complete with 510 Drip Tip and a Chuff cap. Underneath we find three little packages that each house some goodies. In package one we find a sheet of organic cotton; package two has 3 prebuilt twisted coils; and package three has some extra o-rings, 4 grub screws and a 3 way tool. The design of the Troll RDA V2 is actually cool. The airflow can be adjusted in two ways: arrange the slots left to right or by placing the slots in slanted position – pretty neat. The Troll logo is etched into the RDA and the finish is flawless. 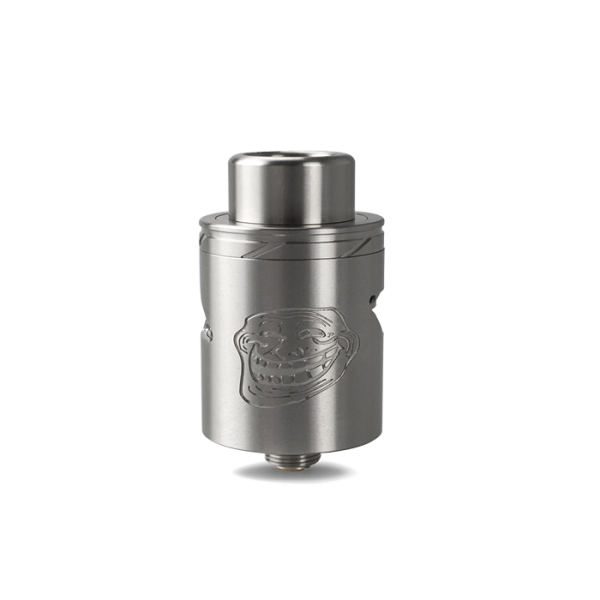 The well of the Troll RDA V2 is pretty deep as well, so you can drip about a half to almost three quarters ML of eliquid into it and it won’t leak. 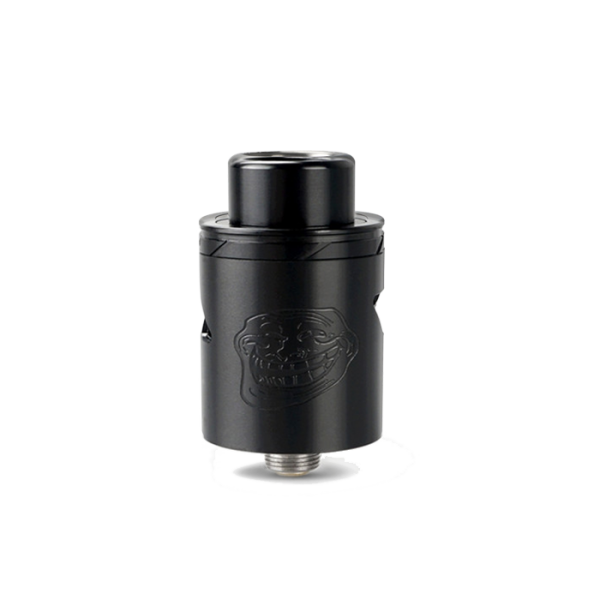 The Troll RDA V2 fits together tightly and comes apart with a slight tug (i’m sure after awhile, though, this will become easier). Also, we find a 2 post Velocity styled deck for building on. The 510 threading is really smooth. I looked the Troll RDA V2 over quite a bit and did not find a single design flaw. This is a well designed, perfectly executed piece of hardware. I decided to use the included twisted coils. After putting them into the Troll RDA V2 and making my final adjustments and wicking them, I set them up for .3ohms. I then proceeded to juice the coils up; again, you can be pretty liberal here as the juice well is pretty deep. The got it up to 175W and it held its own. I took 4 pulls and the Troll RDA V2 got a little warm but not hot. I love the wide open slanted airflow system, as it seems to give my vape a sort of tornado effect versus the left to right airflow slots which give a normal RDA vape. Either way both airflow systems work brilliantly, cooling the vape right down, even at super high wattages. After testing the Troll V2 RDA, I face a bit of a conundrum. You see, I LOVE the Doge 3 — it is pretty much perfect, which is why I award it 10/10 in my review recently. But the Troll V2 is also amazing — easily, a 9/10. And to be honest, I don’t really know how I could recommend one over the other. It really is too close to call. As I finish this review, there is only one thing I am 100% certain of: I’m super happy I own both setups! I most definitely would recommend the Troll V2 to anyone interested in rebuildable set-ups. This RDA has it all — and then some. It looks great, feels awesome, and the flavour and clouds are out of this world. But perhaps the biggest bonus of all is the price — at just $24.95, the Troll V2 is an absolute BARGAIN. Keep an eye on our social feeds — Facebook, Twitter and Instagram — for updates. Also, why you’re here why don’t you subscribe to ourAWESOME newsletter and be in with a chance to win a DNA 200 Mod, Tons of eJuice and a New TANK!